If you do not see a time you would desire, please contact us directly as our online reservations are limited. Thank you. Parking available on public streets and in municipal lot diagonally across street. We gladly assist handicapped patrons with a side path entrance and private parking - please notify us in advance if possible in such circumstances. Visit MVOL.com for our holiday menus! Private luncheons available in our dining room upon request. 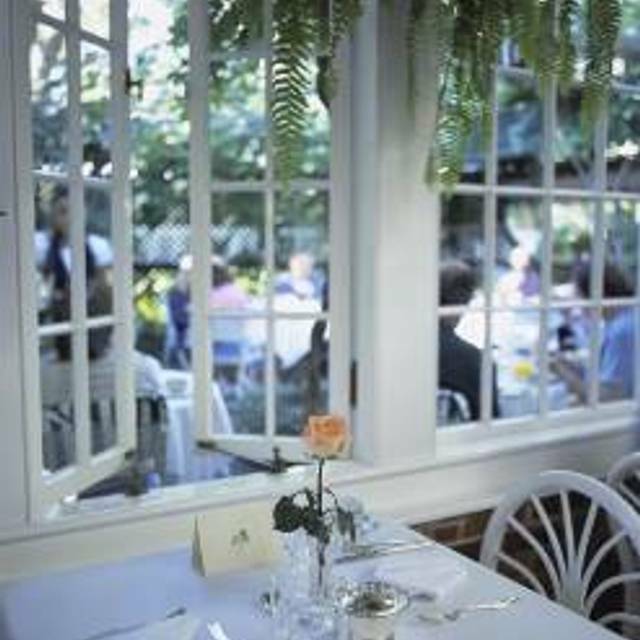 Some of New England’s most acclaimed cuisine is found at The Terrace at The Charlotte Inn. Classic American cuisine showcases many ingredients from Martha’s Vineyard’s own farms and seas, and its bounty of local gardens. Sumptuous meals are presented amidst stunning surroundings. Whether it is by flickering candlelight in the glass-paned conservatory dining room, or beneath the stars on a terrace enclosed by ivy-covered lattice, there is no more romantic or elegant setting in which to enjoy an evening. We request dinner guests dress mindfully of the fine-dining atmosphere. The Terrace serves dinner to the public nightly in season; this setting is most appropriate for adults and children over the age of 14 as to ensure a quiet, romantic setting for our guests. Having run the Relais & Chateaux hotel for over 40 years, The Charlotte Inn is delighted to now own and operate The Terrace, a must-try restaurant for anyone visiting Martha's Vineyard. The Charlotte Inn is such a special place. The food, service and setting always outstanding. Great place! Atmosphere, food outstsnding. What a treat to kick off spring in Edgartown with a sumptuous prix-fixe at The Terrace. 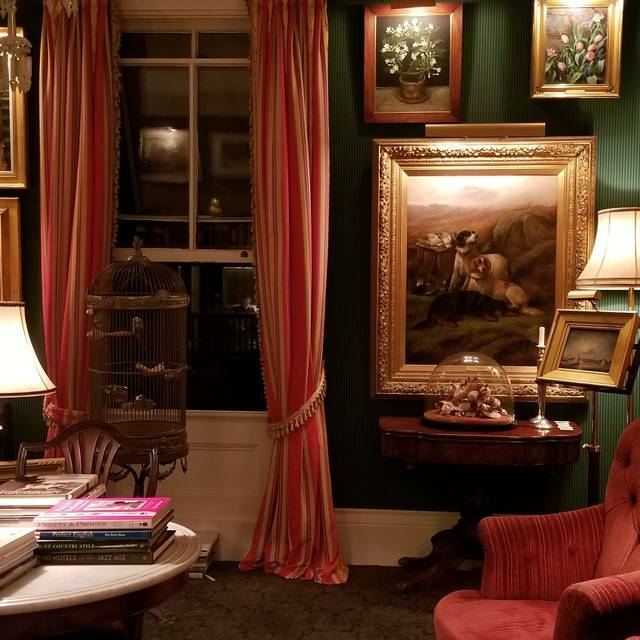 We were welcomed warmly by Lindsey and owner, Gerry as we enjoyed our cocktails among the precious collection of paintings and curios--always an eye popping treat at the Charlotte Inn. We were especially delighted to be among the first to savor Chef "Mikey"'s efforts in his new post! We have followed him in Edgartown over a number of years and he has landed beautifully at The Terrace. The food was inventive and delicious! I can't get the asparagus soup or the foie gras or the delicate gnocchi out of my mind. Congratulations and to all and best wishes for a great season ahead! Put dinner at The Terrace on your calendar! New chef is awesome. Terrace is always good and now even better. very professional and makes us feel at home. This is the place on Martha's Vineyard where we go for special evenings. Outstanding food locally sourced, exceptional service, lovely surroundings. The Terrace is a magical place. The ambience, food, wine, drinks and service is outstanding! Such a fine and unforgettable dining experience. On the expensive side, great for a special occasion. Waiters could have been a bit more personable. Got the feeling it had been a long season and they were a bit staid. Kind of going through the motions. Nonetheless, it is a very special place. A romantic dinner with impeccable service. This is a very special place for us on MV. The impressive entrance to the terrace has a beautiful decor with paintings & period antiques. Food is always well prepared & delicious. I had the Grilled Local Swordfish which was relatively thick & very good. The Halibut was also thick & well prepared. Some entree sides were willingly without question substituted. Service with our waiter James was excellent & attentive. Wine & cocktail portions are generous. This upscale restaurant is quiet unlike most restaurants on the Vineyard where it is difficult to carry on a conversation without speaking loudly. The Terrace is great for a special occasion. Outstanding food, service and ambiance. The entire staff was excellent and attentive. The food was exceptional. It was a perfect evening. Given the cost and reputation of the Terrace, it was most disappointing. The ravioli/lobster dish found the ravioli undercooked and the lobster over cooked and hard to chew. The dining room layout did not make it easy for the wait staff to service diners and were not good in follow-up requests. It will not be possible to recommend. On Auguzt 28 we dined at The Terrace which we have done many times over the years. The Charlotte Inn and the restaurant are special. However, at dinner I ordered a rib eye steak for $55. When it was served it looked delicious but when i tried to cut it, the steak was very tough. I asked the wait staff for a sharper knife but received none. When I had difficulty chewing I asked him to tell the chef hoping he would remedy the problem. The waiter apologized but i was left with an uneatable dinner. Even my husband found it difficult to chew. Such a disappointment. I shall think twice before i return to our recommend The Terrace. Outstanding service, great food, unforgettable experience! The service, quietness and interior were the big stand outs. Most Edgartown restaurants are busy and loud, and it's not uncommon for servers to show disappointment through body language when you order a dessert because they can't flip the table as fast (or when you don't order expensive things like lobster and wine). The service at The Terrace is all about the guest and not about the servers having a good tip night. It was nice and quiet too. I will absolutely go back. A memorable dining experience. Looking forward to our next visit. Will definitely return. Requested an outdoor table which they said was available. Arrived to be seated indoors. AC was too high and was told they would not turn it down I was offered a sport coat although it was my wife who already had her sweater on. Several other patrons asked the same and were turned down. Overall food was good but the whole experience was a little stuffy. This restaurant really fell below expectations and all the positive reviews on line. Our party of four visited on a Thursday in August. There were only 3 or 4 tables filled. The first thing we were told was that there we no mashed potatoes which apparently caused a few entrees to be off the list. Have they never heard of substitutions? our waitress was very slow in spite of the low number of customers. Bread basket never came we had to ask. Food in general was okay but not remarkable. when we were on our way out the Inn host did not reply when we offered our comments about our poor experience. I would pass on this restaurant and find another . This venue continues to be one of my favorites on the Vineyard. The chef did a fine job with meat and fish, the salads, and dessert. The wine list had only a few reasonably priced offerings of top quality wines and the very expensive ones were so marked up in price as to make them unattractive. The restaurant was very sparsely populated at the earlier hours, the only ones when we could get a reservation. It filled up a couple or hours later, but I cannot see the justification for making people come at 5 when there are plenty of empty tables at 6 or 6:30. Another fine experience at the Charlotte Inn. The staff is very consistent year to year and it’s nice to see all the servers again. The food is artistically presented. The chef is very accommodating to allergies and nothing is lost during the modification. Our server was very knowledgeable about the ingredients. I loved that our meals were served on antique dishes and my cocktail was delivered in antique glass. Fine dining at its best. Smart and creative chef. Impeccable service. Beautiful room setting. A classic we will revisit in next trip to vineyard. The Charlotte Inn is a special place. We’ve been going to the Terrace at the Charlotte Inn for dinner for a number of years and love the ambiance. The food and service are always excellent. We reserve the Charlotte Inn every summer when we visit Edgartown with our boat and will continue to go back. The restaurant and Inn have an old world charm and the owner pays attention to every detail. It’s elegant, charming and delicious. they make returning customers feel especially welcome. Amazing, worth the trip and the service was beyond perfect. Celebrating my wife’s 30th and it was great. Like a trip back in time and we enjoyed it very much. Highly recommend! Ambiance was outstanding...five star. Food was very good, not great. Service was fine until they got busy...had to ask for more bread, only refilled water glasses once, even though we were charged for a bottle of sparkling water. Lengthy wait time for desert menu and check. Hostess called and confirmed reservation and went out of her way to make sure I was aware of their dress code. People showed up in shorts and T shirts...what dress code?? When you are a Relais & Chateaux establishment you can't screw up,,,,everything has to be perfect! Hope they get their act together because it is and absolutely gorgeous and romantic spot for dinner. A favorite restaurant that we dine at every year. The service was amazing as always, however, the food this year was a disappointment - pasta noodles were clumped together and the steak lacked flavor. Really great all the way around. This place is not for kids but we had my very quite 7 year old and went early and they were grate about it. But if your kid can’t sit still for 2 hours I recommend going somewhere else. The food and the service was fantastic. We love the Terrace and our waiter JP could not have been better. After a little snafu with the lamb chops, my husband ordered a sirloin and it was superb just like all of the other meals we’ve always had at the Terrace. If you want something special, try The Terrace. You’ll be glad you did!! A fine meal in a beautiful setting. A pretty pricey evening but great for a special occasion. Terrific staff and service. It was a wonderful experience. The food was exceptional. The staff are very friendly. Make sure you order the chocolate cake.